It all started with a very special little horse called 'Hercules' who came into my life when he was a cheeky colt! Then we some foals born but l could not bear to sell them which meant that when they were older they had to earn their living and so The Mini Marvels Team were started! Much has happened since our meeting all those years ago, sadly little Herc has gone to horsey heaven where he is now playing with his other friends. But his spirit lives on in his children and grandchildren who are also in The Mini Marvels, team together we carry on the work he and l started. Read about the Team and what they are doing, check out the Mini Marvel plush toys and lot of other things. What do The Mini Marvels do? 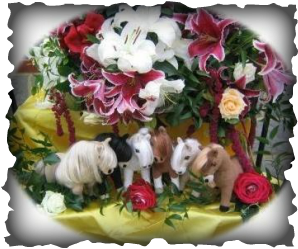 They are a team of miniature horses who first performed their interpretation of Riverdance in 1997, they have been on childrens TV, worked in photoshoots and featured in magazines. They also do charity work, visit Hospices so the patients can meet and stroke them, Hercules made a special visit to Great Ormand Street Childrens Hospital. Some children have had a lovely surprise when a MIni Marvel or two turn up at their birthday party. on the site you will be learning different things about the team and horse health, with lots of photos and some vidios ! Plus The Mini Marvels will be out and about educating children at school, the page will be up soon with more information. The team will visit during term time, so the children will have something to think about and enjoy - from reading - writing to art and even exercise - its MINI MARVELS GO! It is amazing to think that is now 15 years (1997) have past since l put the original Mini Marvels team together to do their long reining displays. They have travelled the country strutting their stuff and putting their best hooves forward, having fun and meeting their fans. Everyones favourite is their interpretation of Riverdance! But this winter we will be putting some new, exciting displays together for the Team lots of fun and action - watch this space. Hercules was also the inspiration behind the Mini Marvel toys that l designed, they are based on reality just for you! l first thought about making the toys when l was in hospital recovering from major back surgery, It kept me busy, as l was in for three weeks & couldn't ride for one year! It took my a few years more before l could finally get them made, but it was worth the wait and they have sold worldwide - very soon l will be writing books to go with them. I thought you might like to see this clip from youtube of one of our fun displays that we have done - let me know what you think. It features top dog trainer Richard Curtis with his dogs and me with two minis!